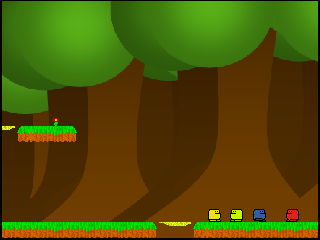 This is a fun platform game where the only way to jump is to use leaves as trampolines! I've been told it's 'Original and Brilliant!'. The download is 10MB but I am making LeafJumper Lite for those of you with slower connections. Enjoy the game! Recommendations: The 2 people who like LeafJumper also like the following games. I will not rate, as it is my game. =) But anywho, thanks for the excllent response from you peoplites. I AM making a fantastical game called Leafjumper 2 right now. Yes RIGHT NOW. That reminds me, I'd better get on with it. Anyway, toodlepip for now. A very good game, though I agree with Mediaman about no save spot. Are you going to do a sequel? wtf?! this thing force me to abort it since the variable dude didn't exists on the object fade or something. You oughtta check that kind of stuff before you release your games.